I recently bought a new book of knitting patterns that I'm excitedly waiting for and while I wait, I thought I'd start swatching for one of the cardigans in the book. Now, before you get all shaky at the knees because I seem so organised ... let me give you a bit of background. I already have three cardigans on my needles. One is my own upcoming pattern and the other two were written by someone else. One of those was started earlier this year with the intention of finishing it for our (just finished) winter. The other hasn't been touched for a year. When I decided to cast on yet another cardigan it was in part due to impulse but also because I desperately need a cardigan that's mostly stockinette. Something I can drag around, pull out and knit on while I'm chatting and something I don't have to constantly be checking against the pattern to make sure it's all working and the numbers make sense. Plus, I'm head over heels in love with the yarn I've chosen, a DK weight Alpaca/Merino blend by Outlaw Yarn; Vanitas and I couldn't help myself. I'll tell you all about the book and the pattern when it arrives. In the meantime, back to the story. I swatched with my usual needles. Wooden Knitpro interchangable tips on a circular needle. (The long dangling bits are because I swatched in the round, dragging my stitches back to the tip of my left needle at the end of each row and looping the yarn around the back to start the new row. I cut the loops when I block my swatch so it lies nice and flat. If you want more details about swatching in the round, check out Jane Richmond's great post here.) Although I'm making a cardigan, it's knitted in the round and then steeked (cut up the middle!). Anyhow, the pattern requires a gauge of 22 sts and 32 rows per 4 inches or 10cm. I got 22 sts and 30 rows with a 4mm wooden needle. The right width but a bit long. Then I remembered a post I read a while ago about different needles creating different gauges with the same yarn. I had a vague recollection that metal needles might make my stitches longer compared to wood. So, I decided to swatch with metal. If you're eagle-eyed you'll notice that I got confused. I did indeed. I didn't need longer stitches, I needed shorter stitches. I needed more rows per inch, not less. I don't know if it's just me but the whole longer, shorter, wider, narrower thing with gauge makes me think twice every single time. It seems all very counter-intuitive! So, irrelevant of what I was after, I did get quite different gauges with metal tips vs wooden tips even though they were the same size; 4mm. With my metal tips I measured 21 sts and 29 rows over 4 inches/10cm. My stitches were longer although they were also wider which confused me. Surely they should be narrower if they're longer? Back to the original post I went. 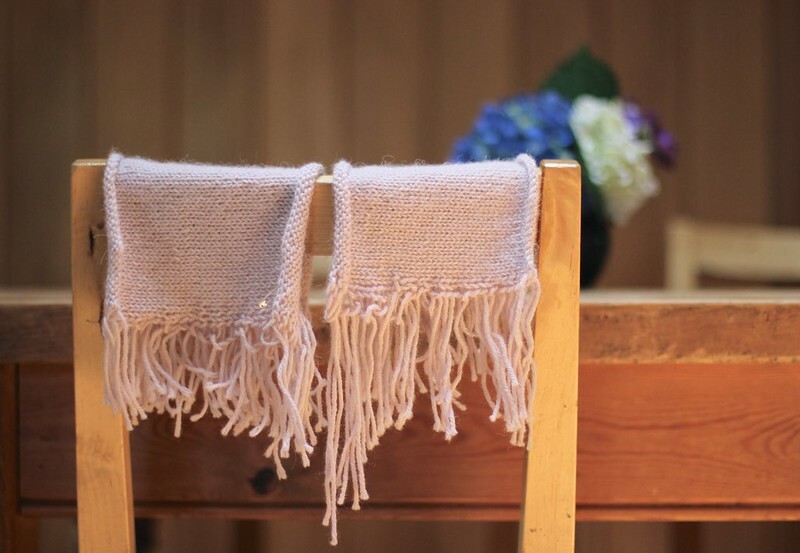 It was written by Alexis Winslow on her blog Knit Darling earlier in the year. She has a great graphic comparing plastic resin, carbon fibre, wood and metal. According to Alex's post, my gauge on metal tips should have been longer and narrower than on my wooden tips. I wondered why mine turned out differently? I think it's because I knit on wooden tips far more often that I do on metal. They're my preferred needle and my gauge is much more even with wood. Just looking at my two swatches tells me that. Even though I should probably try the plastic resin to get perfect gauge, I've decided to stick with wood for my new cardigan. I'm not keen on plastic needles, I like the look of the material that knits up with the wooden needles and my gauge with wood is pretty close to what I need even if it's not perfect. I might have one last go with a slightly smaller needle but if that doesn't work I'll just have to keep an eye on how the yoke is growing with the 4mm needles and adjust it if I need too. What about you? Have you experimented with different types of needles to try to get gauge, not just the size of your needle? My feeling is that many designers will have favourite needles and your choice of needle might have an impact on whether you easily get gauge when using their patterns. I tend to use wooden needles for everything except lace weight yarn for my designs. I wonder if that'd be a helpful thing to note in my patterns? I never used to swatch. Never. I didn't even know what swatching was! I still don't tend to swatch for kids' garments or accessories, unless I'm making up the pattern myself, but when I comes to sweaters and cardigans for me, I have totally changed my ways. Last week I spent a couple of evenings swatching, ripping and swatching again for my Outfit 2 sweater. Can you see how my swatch in the photo has a fringe? That's because I swatched in the round. I needed to do this to check my tension against that required for the pattern (which is knit in the round) and I know that typically my tension changes between knitting flat and knitting in the round. What's clever about the swatch I made is that instead of using a ton of yarn and knitting a complete tube; at the end of each row I slid my knitting to the tip of my left needle and carried my yarn loosely around the back and then knit the next row. I used a circular needle, but you could use a double pointed straight needle. By slipping your stitches and carrying your yarn this way, you are always knitting on the front of your work, just like you do when knitting in the round. Jane Richmond has a great tutorial explaining this technique which you might like to check out. Anyway, making the effort to swatch was especially worth it this time because it meant that I got to test out the stitch pattern. I'm so glad I did, as I've ended up making some changes to the pattern as written so that it suits me better. You see, the front and the back of the sweater are covered with a travelling stitch. It's a two stitch "cable" and although technically it could be done with a cable needle, Veera suggests a method for twisting the stitches without one. I tried but I just couldn't get it right and my stitches were looking AWFUL. Left twist (p/k): purl the second stitch from behind, knit the first stitch, pass both stitches on right needle. I found that my knit stitch ended up too long on the right twist and the left twist was awkward to execute. I wonder if she's a continental knitter and if that'd make this method easier to execute? Anyone tried it? After flicking through my books, I found that in fact there are several ways to knit two twisted stitches. I tried a couple and eventually found a method that I liked. 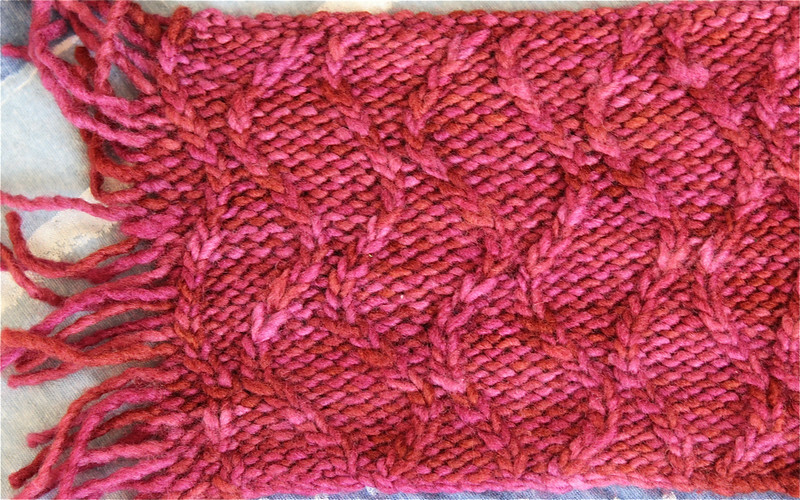 Then, after fiddling with it in my swatch, I decided that my travelling knit stitch looked even better if it was twisted. (You can see the difference between untwisted knit stitches at the bottom of my swatch and twisted ones at the top - see how the top ones are so much neater and my tension more even?). Left twist (p/k): slip the two stitches to right needle as if to SSK, insert left needle through both from right to left and slip back to left needle, purl 1, knit 1 through the back leg. It takes a bit longer but the result is a tight, neat line of travelling twisted knit stitches. I've noted the method I'm using on my Ravelry project page too.